​​​​​ COLLEGE STATION – Stratus Properties Inc. has obtained a $36.8 million construction loan to finance construction of the retail component of Stratus’ Jones Crossing mixed-use development project. 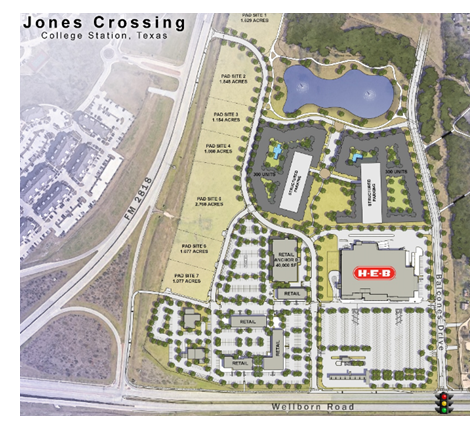 Jones Crossing, situated on a 72-acre tract of land located near Texas A&M University, is expected to total approximately 258,000 sf of commercial space and will be developed in three phases. The retail anchor phase, will be comprised of a 106,000-sf H-E-B grocery store, five mixed-use retail buildings totaling 47,250 sf, six pad sites for sublease, and utility and storm water infrastructure for the entire development. It will include a 40,000-sf secondary anchor building and three build-to-suit pad sites for sublease. Phase three: This phase is planned to include 600 student-focused multifamily units. Construction of the first two phases of the Jones Crossing project has already begun. The H-E-B grocery store is expected to open in mid-2018. ​Check out more mixed-use stories across Texas.